Ask yourself the following questions. If you answer “yes” to three or more of these questions, you could have a hearing problem that needs to be evaluated by your doctor. Do I have ringing, hissing, or roaring in my ears? Do I often misunderstand what others are saying or respond inappropriately during conversation? Do my ears seem too sensitive to sound? Do people complain that I turn up the TV volume too high? Do I strain when trying to understand spoken words? Is it hard for me to follow a conversation when I am speaking with a group of two or more people? Do I have more trouble understanding than most people when I am talking to someone in a noisy area? Do I have trouble understanding on the telephone? Hearing problems happen for many reasons. Hearing loss can run in families which may be present at birth (congenital hearing loss) or be acquired later in life. It is a common condition that affects older adults due to the aging process. Hearing loss can also be caused by exposure to loud noise, infections and other diseases, certain medications, and head or ear trauma. You will likely be evaluated first by an otolaryngologist (also called an ear-nose-and-throat or ENT doctor) prior to being evaluated by an audiologist. Otolaryngologists are physicians who have advanced training in disorders of the ear, nose, throat, head and neck. An audiologist is a professional who assesses, diagnoses and rehabilitates hearing loss for patients of all ages and who has a doctoral degree or master’s degree in audiology. Audiologists practicing in the state of Texas are required to hold a state license. Results of the audiometric evaluation (hearing test) are plotted on a chart called an audiogram. Loudness, soft to loud, is plotted from top to bottom. Frequency, from low pitch to high pitch, is plotted from left to right. The audiogram determines the degree and type of hearing loss a person has. There are three different types of hearing loss; conductive, sensorineural and mixed hearing loss. Conductive hearing losses may be caused by impacted earwax, ear infection, a foreign body in the ear canal, head injury, or absence or malformation of ear structures. These types of problems will affect the ear canal, the eardrum, and the tiny bones in the air space behind the eardrum. Sensorineural hearing loss occurs when the bones, eardrum and membranes are intact but the inner ear organ, the cochlea, is dysfunctional. Conditions that may cause a sensorineural hearing loss include noise exposure, the natural aging process or degeneration of nerves, heredity, genetic syndromes, drugs that are toxic to the auditory system and head injury. A mixed hearing loss includes elements of both conductive and sensorineural hearing loss. This occurs when there is damage or disturbance to the outer or middle ear as well as damage to the inner ear. p>According to the Better Hearing Institute (BHI), 3 in 10 Americans over age 60 have hearing loss; 1 in 6 baby boomers (ages 41-59), or 14.6% have a hearing problem; 1 in 14 Generation Xers (ages 29-40), or 7.4%, already have hearing loss; and at least 1.4 million children (18 or younger) have hearing problems. It is estimated that 3 in 1,000 infants are born with serious to profound hearing loss. Newborns in most states, including Texas, are required by law to have a hearing screen. School age children are screened for hearing problems several times during their school years. Many primary care physicians will complete a hearing screen at the time of an annual physical. By about age 60, everyone should have an initial, baseline audiogram. If hearing is found to be normal, then repeat evaluations every 2-3 years is recommended. Once hearing loss is diagnosed, hearing evaluations should be completed every year. More frequent hearing testing is needed if you are experiencing rapid or sudden changes in your auditory function. People who work in noisy environments are sometimes required by OSHA (Occupational Safety & Health Administration) to undergo a baseline audiogram and periodic evaluations afterwards. What treatment s and devices can improve hearing? Treatment of hearing loss will depend on the type and degree of hearing loss you have. There are various treatments and treatment options. In some cases of conductive impairment, medical treatment or surgery is recommended. In many cases of both conductive and sensorineural hearing loss, hearing aids and/or assistive listening devices are needed. Use of hearing devices may not only help with hearing better in the situations that are important to you such as being with family and friends, but may also simply relieve the strain of hearing which often results in fatigue. They can make soft sounds audible, while at the same time making moderate or loud sounds comfortable. Hearing devices are designed to provide relief in both noisy and quiet situations. Wearing hearing devices can put you at ease during conversations and make you less likely to have to ask others to repeat themselves. They can help you re-establish connections to the world. It is advisable to arrange to try hearing devices within your own unique listening environments to determine whether the benefits received are what is desired. Medical Center Hearing Aids offers in office demonstrations and a 30-day evaluation period as well as real ear verification measures. Do I buy one hearing aid or two? Approximately 80% of people with hearing loss will have it in both ears. When hearing loss is in both ears, two hearing aids will provide greater benefit, in most cases, than if one were to wear one aid on the poorer ear. This is because we hear in our brain, not in our ears. Our two ears help the brain to hear as nature intended. Some benefits of amplifying both ears are better overall sound quality, increased ability for speech understanding in noise, and improved localization ability (detecting where sounds are coming from). Research now suggests that there can be changes in the way in which your brain processes sound when it is “starved” of sound. An ear that does not receive and send sufficient sound information to the brain may eventually loose the ability to discriminate speech sounds. There are always special cases where only one hearing instrument is indicated. While some individuals may get by using one hearing aid when two are recommended, wearing two hearing aids may be more beneficial than ever with the latest digital hearing instruments. The term DIGITAL is used less often today because practically all hearing aids are digital. When the term “digital” is used to refer to hearing aids, it generally means the hearing aid is a “complete computer”. Many years ago, before the digital age, hearing aids were analog sound processors, offering minimal adjustability beyond simply amplifying sound. Then came programmable analog circuits which gave hearing aid dispensers finer tuning ability, which in turn benefited the hearing aid user. The first digital processing hearing aids became available in 1996. Since the early days of digital, improvements in chip design have made processing faster and hearing aids smarter. Today’s digital hearing aid can be a highly flexible and sophisticated instrument with automatic features that help to preserve speech components both in quiet and when noise is present in the environment. This makes listening in noisy situations more bearable compared to older technologies. There are also digital hearing aids that have fewer automatic features and more manual control for people who prefer these features. The purchase price of hearing aids is a bundled fee that includes your hearing aid evaluation, hearing aid fitting and orientation, follow-up visits to check your progress and to measure benefit of amplification, as well as, the hearing instruments themselves. The price you are asked to pay will depend on the level of technology that is selected by both you and your audiologist. There are essentially four levels of hearing aid technology, and product lines range from economy styles to premium products. The purpose of the hearing aid evaluation is to select the most appropriate hearing aid for your hearing loss, your lifestyle, cognitive ability, manual dexterity, and the communication situations you would like to improve. Does insurance cover the cost of a hearing aid fitting? In some cases, the answer is “Yes”. If you have been told by a hearing professional that you would benefit from hearing aids or you think you may need hearing aids, check your medical insurance company for any hearing aid benefit. In some cases, medical insurance may pay for a portion of the cost or up to certain amount. It is your responsibility to understand your insurance benefit. Medicare, however, never pays for hearing aid fittings or hearing tests for fitting a hearing aid. If you have no insurance benefit and require financial assistance to purchase a hearing aid, there are programs to which we can refer patients that require an application to determine eligibility. One such program here in Texas is the Department of Assistive and Rehabilitative Services (DARS). There are other agencies that help with hearing aid purchase. We also offer a payment plan through Care Credit, a type of medical credit card. Why do some people who have hearing aids either complain about them or do not use them? There are a variety of reasons why hearing aids are perceived to be ineffective or not used. First time wearers often do not realize that receiving the full benefit from hearing aids requires an adjustment period. Although hearing starts at the ear, the final component in the auditory process is the brain. As hearing is gradually lost, the brain does not realize that the sound it is receiving is not the same as it was before, and what the brain perceives as being normal really is not. When someone begins wearing hearing aids, he/she becomes aware of sounds that had either previously been heard at a softer volume due to the hearing loss, or perhaps not even heard at all. The brain then must learn to sort through these sounds and determine what is important and what is not (i.e., background noise). This does not happen overnight, but is a process that can take days, weeks, or even months. If a person chooses to only wear their aids in the most challenging listening situations, without the experience of learning how to hear with amplification in easy listening environments such as the home, this practice can lead to minimal benefit perceived by the hearing aid wearer. It takes time to get used to all the new sounds you will hear in quiet and noisy settings. The expectations of the new hearing instrument wearer need to be realistic. Hearing instruments will not restore hearing back to normal, but they can greatly improve the ability to hear and communicate in a variety of situations. Regarding experienced hearing aid wearers, a hearing instrument that is old may no longer be appropriate for the individual’s hearing loss. This can happen as hearing gradually worsens over time due to presbycusis. Occasionally, a hearing instrument may be chosen primarily for its cosmetic appeal. Some patients are not candidates for the smallest or more invisible types of aids, but are willing to sacrifice benefit when they are more concerned about appearances. In these cases, patients are pleased at first with the look of the aid, but are much later disappointed in the lack of benefit often due to the lack of necessary circuitry and other missing features. Any hearing device that is purchased without the expert advice of an audiologist/hearing aid dispenser may result in a less than optimal fitting. This can happen when such devices are not professionally fitted. For this reason, the audiologists at Medical Center Hearing Aids, Ltd, do not promote the purchase of hearing aids through internet websites in which you select your hearing aid based on descriptions of hearing aid features and then the hearing aid is mailed to you. The choice of the best hearing instruments depends on many factors and can often be confusing. Hearing aids often work very well when selected, professionally fitted, and programmed by an audiologist/hearing aid dispenser. 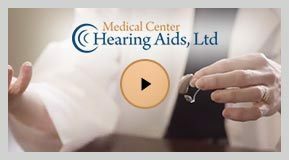 Our audiologists are experts in choosing the most appropriate hearing assistance and providing support and counseling throughout the adjustment period. Learning to listen with hearing devices takes time and patience in the beginning. You may need to learn to filter out unwanted sounds, just as you used to do with normal hearing. Virtually all patients wearing hearing aids complain about background noise at one time or another. There is no way to eliminate background noise. The sound of wrinkling newspaper or water running may be annoying at first, however, after about 2-3 weeks, you will notice an adjustment to these sounds. Your listening skills should improve gradually as you become accustomed to amplification. It’s also important to be realistic and not to expect to understand 100% all the time. Besides helping you to hear and understand voices better, properly adjusted hearing devices will allow you to hear sounds that previously may not have been audible. Gradually increasing the amount of time you wear the hearing aids and following the schedule provided by your audiologist will result in an easier transition to amplified sound. During the initial adjustment period, you will be asked to visit your audiologist for follow-up to monitor your progress and adjust the settings of your hearing devices, if needed. Subsequent follow-up visits are often needed and are crucial to your success with amplification and in improving your communication ability. Hearing devices are typically replaced every four to seven years. When a hearing aid reaches the five-year mark, it is “old” by industry standards. The need for new hearing instruments may occur if a patient’s hearing status changes, however with the flexibility of the new digital technology for adjustments, purchasing new devices can typically be prolonged. An ALD is any device used to alert you of sounds in your environment or to improve your communication or listening quality. You may have certain communication needs that cannot be solved using hearing aids alone. These situations may involve the use of the telephone, radio, television, and the inability to hear the door chime, telephone bell, and alarm clock. There are many assistive listening devices available today, from sophisticated systems used in theaters and auditoriums to small personal systems. People with all degrees and types of hearing loss – even people with normal hearing can benefit from assistive listening devices. Tinnitus is the term given to any perception of sound when no external sound is present. Tinnitus is often referred to as “ringing in the ears,” although some people hear hissing, roaring, buzzing, or pulsing sounds in the ears. It is a symptom that can be related to almost every known hearing problem. Tinnitus can be temporary (acute) or permanent (chronic) and ranges in severity from mild to severe. Tinnitus is a very common disorder. Nearly 50 million people in the U.S.A. have tinnitus which is about 10% of the population. Is there something that can be done about tinnitus? Generally, most patients will not need any medical treatment for their tinnitus. For patients who are greatly bothered by their tinnitus, they may use some techniques such as listening to a fan or radio to mask their tinnitus. Because the physiological mechanisms of tinnitus are not thoroughly understood, approaches for the management or treatment of tinnitus are varied. Now, there is no drug approved by the FDA to treat tinnitus. While there are supplements on the market that claim to provide tinnitus relief, there is no proven evidence to support the claims. Sound therapy, or the use of any sound for tinnitus management, along with counseling is a widely-accepted method for managing tinnitus. Other accepted tinnitus management methods include Tinnitus Retraining Therapy (TRT), Progressive Audiologic Tinnitus Management (PATM), and cognitive behavioral biofeedback therapy. While these treatments do not provide a cure for tinnitus, they can allow the tinnitus sufferer to take control of tinnitus, rather than let tinnitus control them.